Tunnel lining is a demanding application to which Quietstone is perfectly suited. Many properties maybe required such as, a resistance to fire, the ability to absorb noise and vibrations, in addition the tunnel lining solution will need to be highly durable to reliably withstand the various environmental conditions. Quietstone offers the ideal solution for tunnel lining projects. Acoustics in the built environment is becoming a topic of growing concern. Recognizing this, we aim to provide straightforward and effective solutions for areas where standard acoustic products fail to meet demanding requirements. These demands generally include high durability and pull-off strength, ease of maintenance, high fire safety, long life span and weather resistance. Our products have been tested to EN-ISO 11654 Class B under typical tunnel mounting conditions and fire safety tested to withstand 1150°C for 2 hours. A world first product, Quietstone FR30 has the unheard of combination of high sound absorption, durability and heat resistant. This means it acts to protect the tunnel and services in the event of a fire, without the need for specialist fire protection panels. Very similar to Quietstone but with higher heat resistance, this is now our standard product for tunnels and passes all current European standards. When extra mounting fixtures aren’t viable or when retrofitting noise control measures, Quietstone Light is an ideal option because of its high durability, long life-span and the ability to bond directly to a substrate. 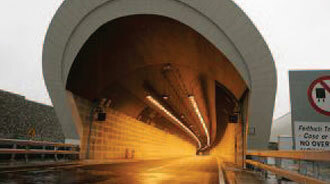 Tried and tested our products have been used for many tunnel lining projects. The A4 Burgerveen Leiden Road Tunnel in Holland was lined with Quietstone to reduce the noise impact of a new motorway. Quietstone was also used at both entrances of the Dublin Port Tunnel to control the noise levels experienced by near by residents. Our product was selected at the Dublin Tunnel as no other sound absorber would be able to withstand the pressure changes while providing high sound absorption, long life-span and non-combustibility. Leeds ‘light’ underpass in Neville Street, Leeds used Quietstone to control the ambient noise and provide an unexpectedly tranquil passage through the tunnel and also serve the audio installation which further improves the ambiance by playing urban music throughout!